A food allergy is type of immune response triggered by eggs, peanuts, milk, or some other specific food. A true food allergy is much less common. The immune system normally protects the body against harmful substances, such as bacteria and viruses. It also reacts to foreign substances called allergens. These are usually harmless, and in most people, do not cause a problem. In a person with a food allergy, the immune response is oversensitive. When it recognizes an allergen, the immune system launches a response. Chemicals such as histamines are released. These chemicals cause allergy symptoms. In rare cases, food additives, such as dyes, thickeners, and preservatives can cause a food allergy or intolerance reaction. Melons, apples, pineapple, and other foods contain substances that are similar to certain pollens. The reaction most often occurs when you eat the raw form of the foods. How severe the reaction is depends on how much of the food you eat. Symptoms usually begin within 2 hours after eating. Sometimes, the symptoms begin hours after eating the food. Key symptoms of a food allergy include hives, a hoarse voice, and wheezing. In a severe reaction, called anaphylaxis, in addition to the above symptoms, you may have low blood pressure and blocked airways. Blood or skin tests are sometimes used to confirm that you have an allergy. A double-blind food challenge is one way to diagnose true food allergies. During this test, you and your health care provider will not know what you are eating. With elimination diets, you avoid the suspected food until your symptoms disappear. Then you start eating the foods again to see if you develop an allergic reaction. In provocation (challenge) testing, you eat a small amount of the suspected food under medical supervision. This type of test may cause severe allergic reactions. Challenge testing should only be done by a provider. Never try to cause a reaction or reintroduce a food on your own. These tests should only be done under the guidance of a provider, especially if your first reaction was severe. If you suspect that you or your child has a food allergy, see an allergy specialist doctor (allergist). Avoiding the food (this is the most effective treatment). Desensitization, during which you eat a small amount of the food each day. This must be done under an allergist's guidance. Other treatments, including allergy shots and probiotics, have not been proven to help with food allergies. If your child has a problem with cow's milk formula, your provider may suggest trying a soy-based formula or something called an elemental formula, if it is available. If you have symptoms on only one area of the body, for example, a hive on the chin after eating the food, you may not need any treatment. The symptoms will likely go away in a brief time. Antihistamines may relieve the discomfort. 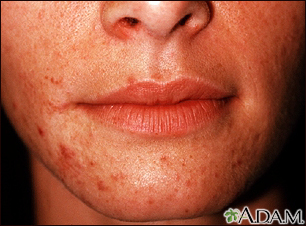 Soothing skin creams may also provide some relief. Then go to the nearest hospital or emergency facility right away, preferably by ambulance. 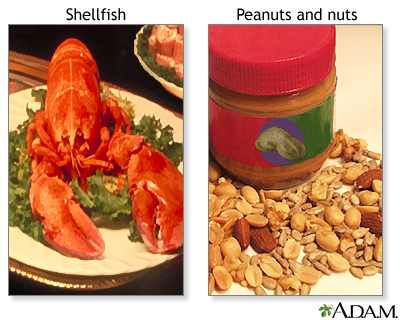 Allergies to peanuts, tree nuts, and shellfish tend to last a lifetime. 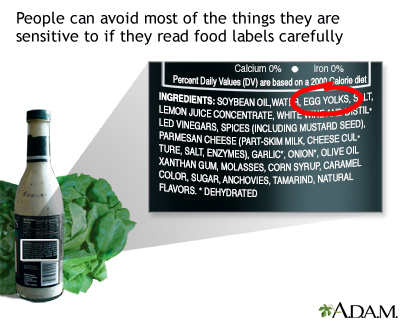 Avoiding the problem foods may be easy if the food is uncommon or easy to identify. When eating away from home, ask detailed questions about the food you are served. When buying food, read package ingredients carefully. 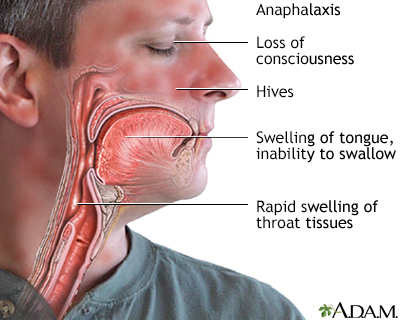 Anaphylaxis is a severe, whole-body allergic reaction that is life threatening. Although people with oral allergy syndrome may have an anaphylactic reaction in rare cases, they should ask their doctor if they need to carry injectable epinephrine. Call your local emergency number, such as 911, if you have any serious or whole-body reactions, particularly wheezing or difficulty breathing, after eating a food. Anyone who has had an allergic reaction to a food should be seen by an allergist. Breastfeeding may help prevent allergies. Otherwise, there is no known way to prevent food allergies. A common belief and practice is to delay introducing allergy-causing foods to infants until their gastrointestinal tract has had a chance to mature. The timing for this varies from food to food and from baby to baby. Avoiding peanuts in early childhood does not appear to prevent, and may even enhance, the development of peanut allergy. Doctors don't know whether it is effective to introduce foods that commonly cause allergies in breastfed or other children to prevent future food allergies. Always discuss this with your child's provider. Bohle B. Food allergy. In: Rich RR, Fleisher TA, Shearer WT, Schroeder HW Jr, Frew AJ, Weyand CM, eds. Clinical Immunology. 4th ed. Philadelphia, PA: Elsevier Saunders; 2013:chap 43. Du Toit G, Sayre PH, Roberts G, et al; Immune Tolerance Network LEAP-On Study Team. Effect of avoidance on peanut allergy after early peanut consumption. N Engl J Med. 2016;374(15):1435-1443. PMID: 26942922 www.ncbi.nlm.nih.gov/pubmed/26942922. NIAID-sponsored expert panel, Boyce JA, Assa'ad A, et al. Guidelines for the diagnosis and management of food allergy in the United States: report of the NIAID-sponsored expert panel. J Allergy Clin Immunol. 2010;126(6 Suppl):S1-S58. PMID: 21134576 www.ncbi.nlm.nih.gov/pubmed/21134576. Sicherer SH, Lack G, Jones SM. Food allergy management. In: Adkinson NF Jr, Bochner BS, Burks AW, et al, eds. Middleton's Allergy: Principles and Practice. 8th ed. Philadelphia, PA: Elsevier Saunders; 2014:chap 84.